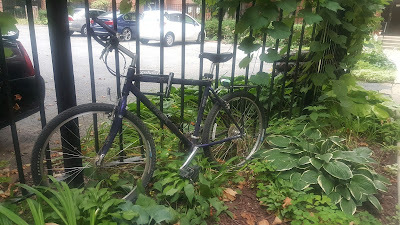 My trusty 1998 Trek 7000 has been my city bike for almost 20 yrs! I spent the last few days riding my bike to our showing and contractor appointments around Lincoln Square and Edgewater. With four kids, listings and buyers in the suburbs and lots of variation in my schedule it has been more difficult to go "bike only" most days. However the city affords me the option when available. The last three days have been car free. I wrote about riding on showings back in 2008 and organized an open house tour by bike in 2009 (when homes were a little tougher to sell!). Lincoln Square and Edgewater are particularly easy to cycle. If my appointments are further south in Lakeview or Lincoln Park I may hit the lakefront paths. Being a career Realtor/ Broker has probably influenced me to ride around the city more than if I had a more traditional downtown job. Streetsblog Chicago and The Chainlink are go-to resources for cycling in Chicago and near burbs. If you'd like a bike friendly Broker give us a call!